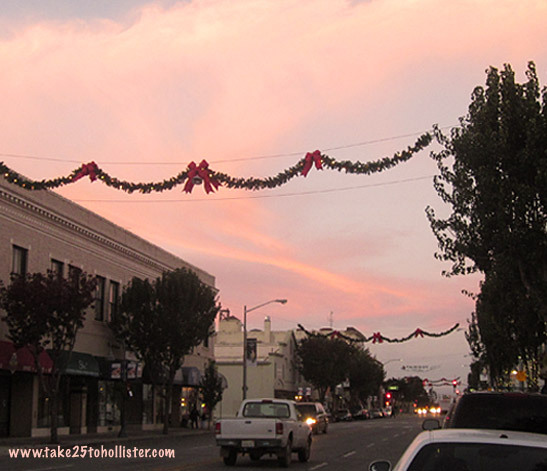 It's starting to look quite festive in Downtown Hollister, despite the cars and trucks zooming down San Benito Street. Slow down, people. Yesterday evening, for nearly an hour, the Husband and I watched the traffic on our main street. We were alarmed at how fast the vehicles traveled in both directions. A downtown business owner told us it's like that even during the day. We've also heard that some people have had scary experiences crossing San Benito Street. The City of Hollister has a plan to help slow down the traffic and make downtown be a pedestrian-friendly place. That would be also great for the shops and restaurants down there. Not to say for bringing future businesses to downtown. This traffic plan is ready to go, from what I understand. Hopefully the execution of it won't drag on too long. Otherwise, San Benito Street continues to be a drag strip. 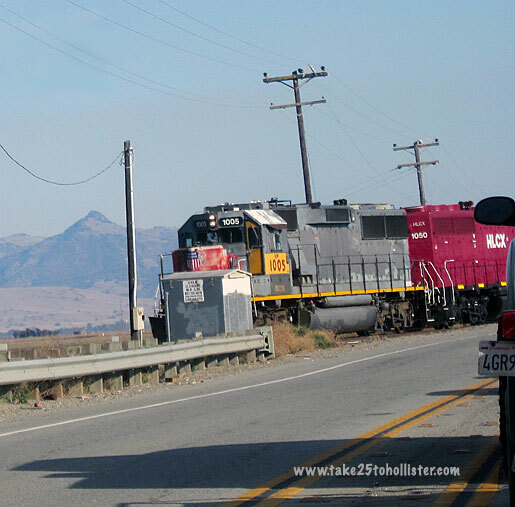 Yesterday afternoon, we waited for a train to cross Bolsa Road (aka Highway 25) on the track near the county line. 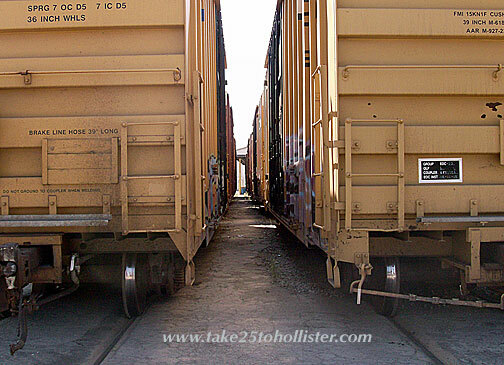 Usually I see a train leave or enter Hollister by Burger Factory on San Benito Street. 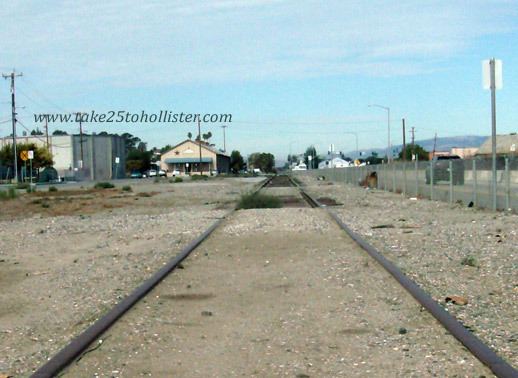 I can't recall the last time I saw a train anywhere else on that track to and from Hollister. What a treat! Yesterday afternoon, the Husband and I opted to take the bus to Downtown to pick up our car from the shop. We had enough exercise from walking home earlier, after a yummy breakfast at Cozy Cup Cafe. The walk under the trees on Monterey and San Benito Streets was delightful, passing by a lot of cute old houses. We couldn't get over how big some of the lots were. 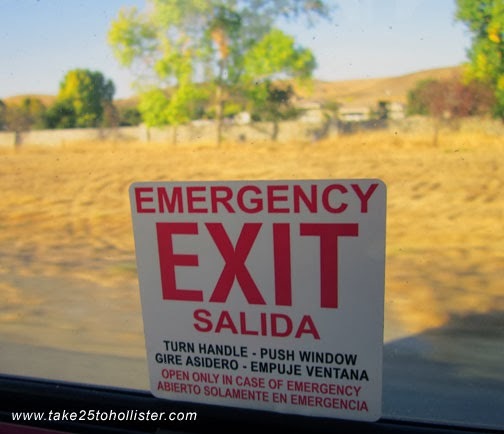 This was our fifth bus ride on the San Benito County Express. The other times were taking the bus to and from the county fair the last two years. For free, too. I keep digressing, don't I? The bus ride to downtown was short and sweet. And, because it our first time, we made it a fun adventure. Not that were rubes about taking buses. Both the Husband and I used the public transportation system regularly when we lived up in the Bay Area for many years, once upon a time. The Blue Line runs about 35 minutes apart so it was important we got to the bus stop on time. An elementary school kid was doing his math homework when we got there. The sweet kid was obviously a regular bus rider. He took us old people under his wing. He assured us that we hadn't missed the bus. "It'll be here at 2:55." He also told us that without a discount, the fare is a dollar. 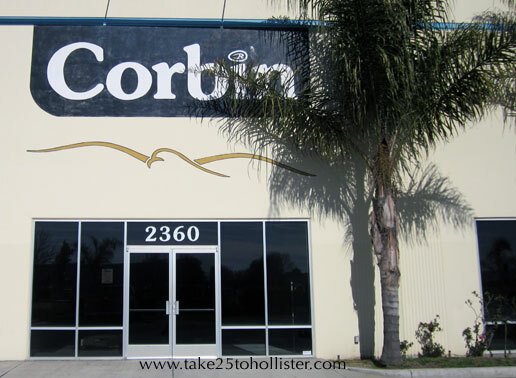 As we rode along, I wondered if more people will take to the buses as Hollister gets even more bigger. 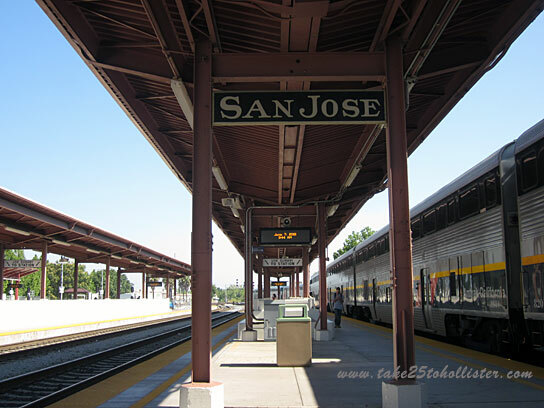 The San Jose Diridon Station on Cahill Street is a hub for both Amtrak and Caltrain. One day, BART will reach there. Yesterday morning, the Husband and I were sitting at the station waiting for my godmother to board the train. I was excited just sitting there, wishing I was going off on a train somewhere. 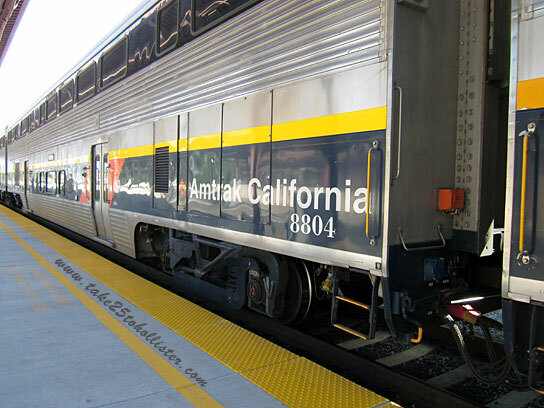 Riding a train makes me feel like I'm on a grand adventure, even if it's just up to San Francisco and back. I've probably ridden the train less than 10 times in my life so far, but I think it's the most civilized way to travel. Get on, find a seat, enjoy the scenery, chat, read, nap, enjoy the scenery, and get off. 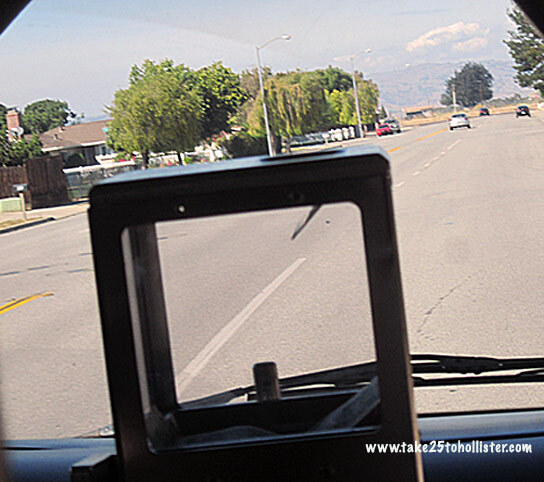 No hassle of traffic jams, tailgaters, and aggressive (or timid) drivers. Too bad Hollister no longer has a train station. 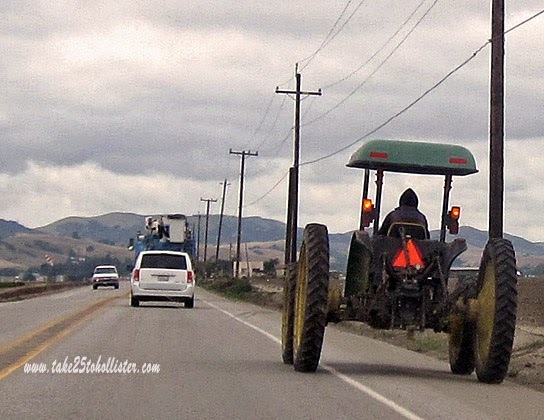 A slow-moving tractor on Highway 156 is an annoyance when you're in a hurry. But, that's no reason to dangerously tailgate the tractor or the car. It's best to decrease speed (both your car and yourself), breathe in deeply, and enjoy the rural surroundings until it's safe to go around the tractor. If you're running late, pull over when you can and call your destination. If you're not late, why get yourself mad or upset? I haven't seen too many big trucks rumbling through town since the Highway 25 bypass was built a few years ago. 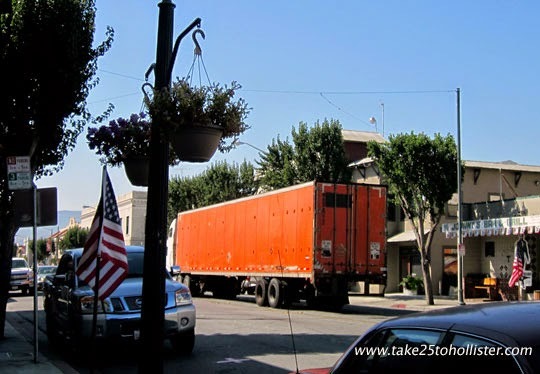 So, this orange dude of a truck caught my eye as it rumbled through the intersection. I managed to get a shot before it got too far out of range. I'm hanging out at Our World Tuesday. Click here to check out bloggers from other parts of the U.S. and the world. 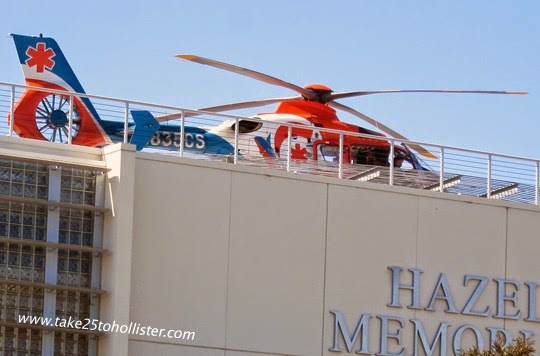 CALSTAR stands for California Shock Trauma Air Rescue. Thank goodness for CALSTAR! It transports patients at Hazel Hawkins Hospital who require special treatment to hospitals in the Bay Area. CALSTAR is a nonprofit air ambulance service that serves several regions in our states. San Benito County is part of the CALSTAR 5 area, which also serves the Monterey, Santa Cruz, and Northern San Luis Obispo counties. For more information, visit the CALSTAR website. This year the Husband and I took the San Benito County Express's free shuttle to the San Benito County Fair. It was the best way to travel. The only stress for us was making sure we got down to the bus stop in time. We could've driven and parked next to the stop, but the whole idea was to experience getting from here to there and back by just walking and riding the bus. The final assessment: We would do it again. The bus was clean, comfortable, and safe. Every seat had a seat belt. The drivers were friendly and courteous. The fair had someone on board to sell us our tickets. Convenient, yes? And, the shuttle stop at the fairgrounds was precisely in front of the Pavilion. Hello, no hiking a fair distance from the car over uneven ground. A very nice plus for young old fogeys like the Husband and me. We got on at Veterans Park, the first stop, so that we could see the sights on the shuttle's full loop around Hollister. 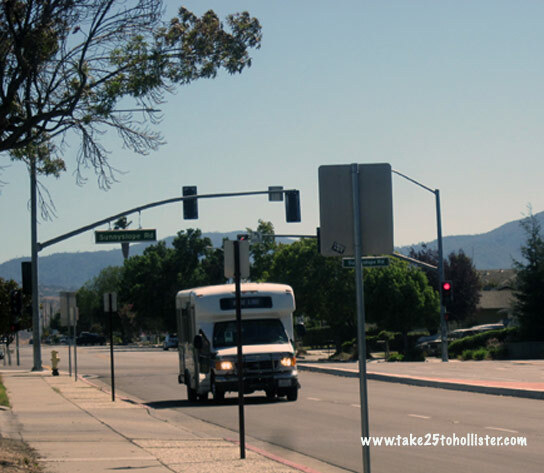 To see the photos I took from the shuttle, head over to the album Riding the Free Shuttle to the County Fair at Take 25 to Hollister's Facebook page. You don't need to be signed on or even be a Facebook member to access this link. The freight box cars usually sit behind the cannery warehouse on Sally Street. During the Great Depression, my uncle rode the freight train to get from here to there to find work. Just like in the movies, he hopped onto a box car. He rode all over with hobos. Funny, how he never considered himself one. 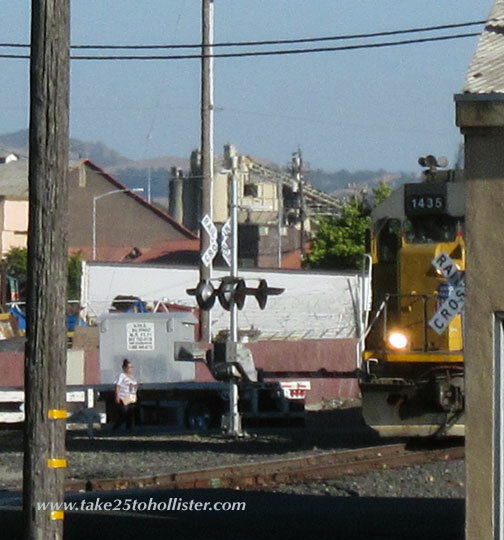 The Union Pacific freight train comes into town almost every day, especially during the cannery season. You don't have to be downtown to know it's here. Toot! Toot! can be heard at least as far as Sunnyslope School. After watching this 2007 video by Tom Vance, I now understand why the train whistles so much. And, it's not because it's saying "Hello, people!" It's more like "Hey people! Look out! I'm bigger and heavier than you and may crush you if you insist on suddenly getting in my path." 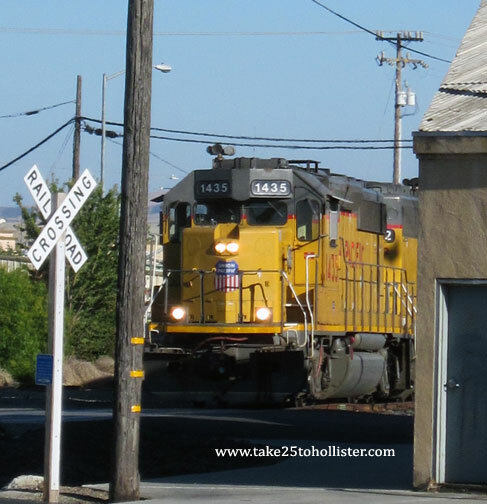 Vance shot a freight train leaving Hollister on an April day. I was somewhat dumbstruck as I watched the first part of the video as the train left town. 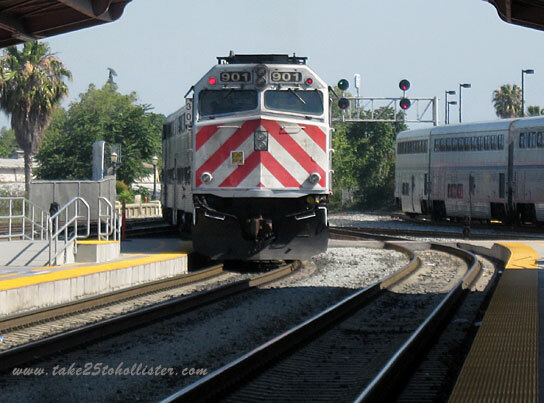 Drivers swooshed over the tracks before the railroad gates came down; two teenage girls walked in front of the train; and one driver backed off the tracks. As the video shows the train lumbering out of town, you see country sights you can't see as you're zooming down Highway 25. Take a look. Here's the link again. Slowly, but surely, the train rumbles towards Second Street on it way out of town. 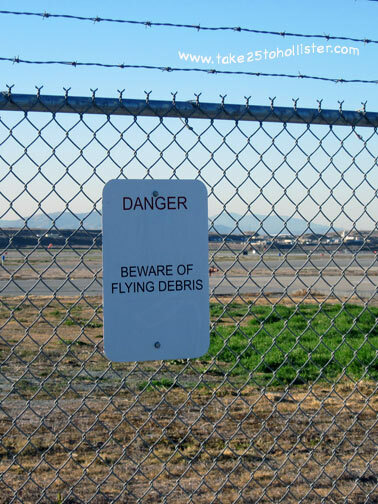 One of my favorite "caution" signs is over at the airport. It's an essential sign, no doubt about it. It also brings up silly thoughts as well. You can find the sign near the new dog park. Until I moved back to Hollister several years ago, I rarely, if ever, referred to the main drag through town by its actual name. Now, I'm in the habit of saying San Benito Street, and it's weird whenever I say Main Street or even hear it as such. • San Benito Street (north end) turns into San Felipe Road at Santa Ana Road. 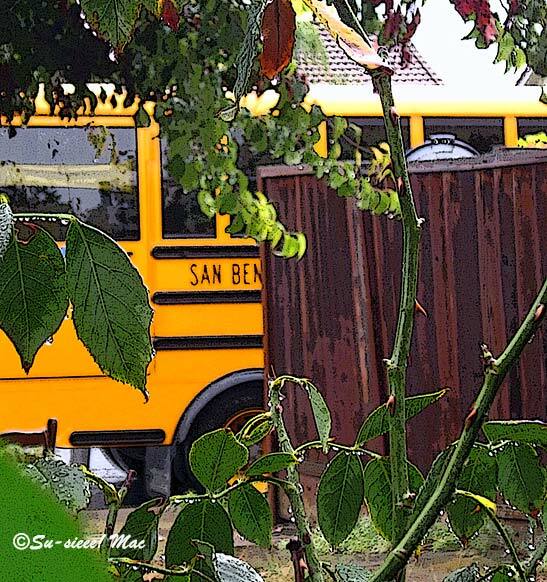 • San Benito Street is originally part of highway 25. Technically, it may still be highway 25. 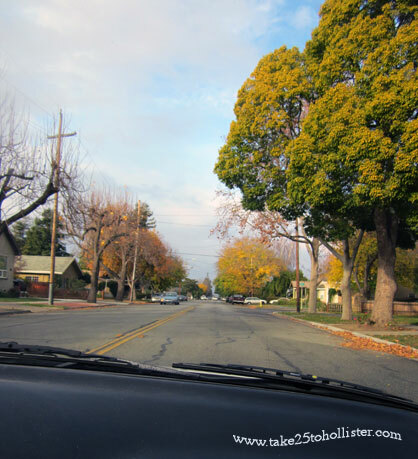 The city of Hollister built the 25 bypass a few years ago so that it can claim the main street as its own. The move is part of the plan to revitalize downtown. So far as I know, Caltrans hasn't completed the transfer. P.S. Thank you, Mr. Arrmac for pointing out my grammatical errors, which dear readers, who're reading this P.S. will never know. Absolutely none. So what, if I have to wait through another cycle of lights to turn left from San Benito Street onto Tres Pinos Road, or from Sunnyslope Road onto Highway 25. That totally beats the 30 minutes, sometimes 45 minutes, of driving four or five blocks in San Francisco to get onto an exit to the Bay Bridge during the early afternoon commute, which I used to do for a short while many years ago. I won't even grumble about the stop and go traffic on the bridge. 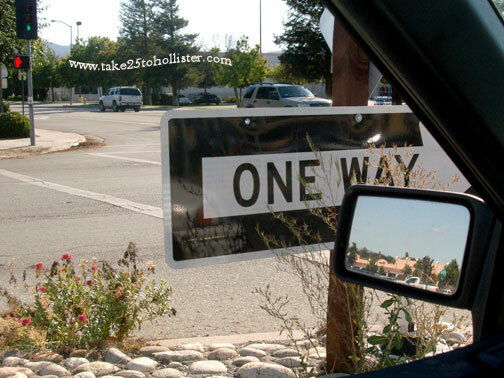 So, yes, when it comes to traffic, we have it made in Hollister. Driving north on Bolsa Road, aka Highway 25, just before Shore Road. When I was a kid, I lived on Hillcrest Road near the Catholic cemetery. Late at night after most of the world had gone to sleep and I lay in bed waiting for sleep to find its way to me, I occasionally heard big rigs shifting their gears as they gained speed to somewhere along Fairview Road. Always wondered where they were heading. 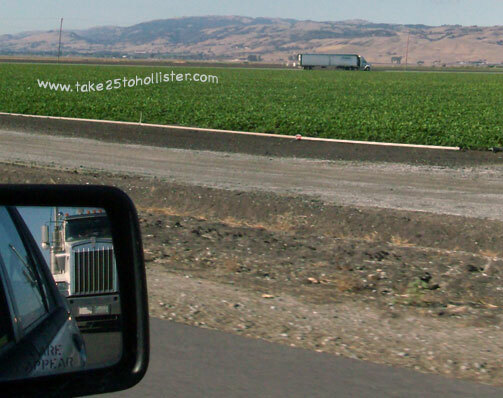 Just did a quick search on trucking companies in Hollister. Still are quite a lot around. 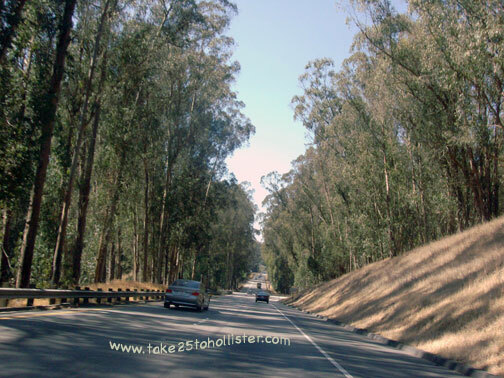 On Highway 101, just south of the 156/San Juan Bautista/Hollister exit (entrance), you drive through a small eucalyptus forest. The trees are descendants of seedlings that were first planted by a farmer in 1912. Click here for an interesting tale about how these Australian trees took hold in California. If you've ever seen the movie Vertigo by Hitchcock, you may remember a scene in which Jimmy Stewart and Kim Novak are driving through this eucalyptus grove. 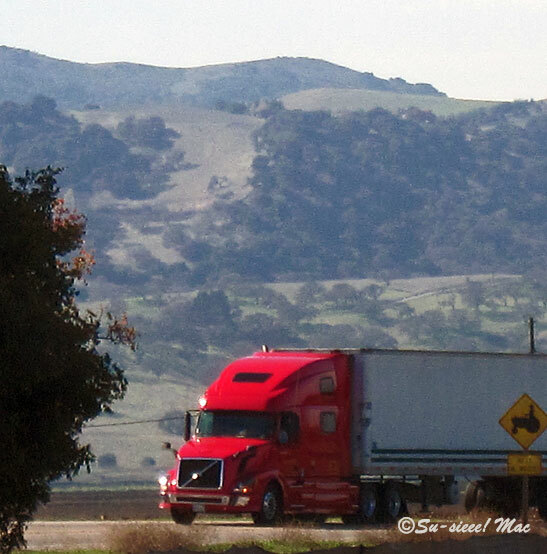 They're driving south from San Francisco to San Juan Bautista. In real life, that would mean they missed the exit to San Juan.